For the last three years I have gone with my family to the county airport to see hot air balloons. I have seen balloons in the shape of a spider, a robot, a castle, and a shoe with balloon kids in a frozen climb to the top. Until this year it was always hot and humid until evening when the fires that make the balloons lift would go off sending a wave of soft light illuminating the huge crowd. Only on this past Saturday, it was pretty cold and the wind was fierce. 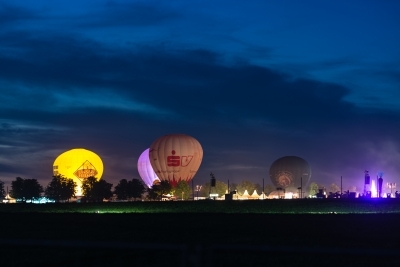 As a result the owners of the hot air balloons were unable to inflate the balloons. It was a disappointment to not see these floating giants and to hear the squeals from kids in the crowd in awe nor to see families smiling and taking pictures with their cell phones. I thought what a shame to have paid to be here. My family and I should have skipped coming but then things changed. Several kids including my niece waved off the cold and marched off to be put in a harness so they could jump bungee style on a giant trampoline. To them who cares if the hot air balloons didn’t inflate we have this source of fun and we are going to embrace it. I admit their feelings spread and took hold of me, my brother and his wife . We couldn’t possibly shatter my niece’s happiness to tell her you can’t do this. So we waited in line patiently for her to have her turn. When she did I took snaps shots with my cell phone and beamed with happiness. It was in these moments watching my niece jump with glee that I knew the price of admission became worth it.